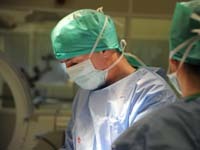 We are a centre of excellence for orthopaedics and soft tissue surgery. Led by Shane Guerin, our team offers the finest of orthopaedic care and specialises in fracture management. We have a dedicated orthopaedic theatre, specialised theatre nursing staff and equipment at our disposal. Shane has interests in all aspects of surgery but particularly fracture repair and trauma management. 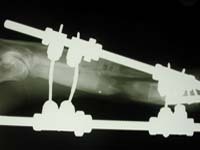 Trauma is the most common cause of bone fractures. In most instances, we take X-rays to determine the severity and location of the break as well as to assess for other internal injuries. Once we are satisfied that a pet is stable enough to undergo general anesthesia, we can use surgical or non-surgical means to immobilize the fracture. 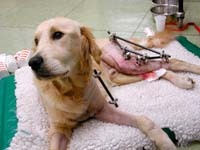 Most fractures in dogs and cats require surgery since they walk on all four limbs. Our surgical team is internationally recognized for its expertise in fracture management and will advise the pet owner of treatment recommendations. Our recent acquisition of a state-of-the-art, intraoperative C-arm X-Ray Imaging System allows us to use minimally invasive treatment methods for fractures that, only a few years ago, required extensive tissue dissection and manipulation. The cranial cruciate ligament (CrCL), often referred to in humans as the anterior cruciate ligament (ACL), stabilizes the knee joint and allows for proper joint movement. When the CrCL is torn, stretched, or degenerating, the knee joint becomes uncomfortable as a result of instability, abnormal movement, and inflammation. Our team is internationally known for its expertise in the surgical treatment of CrCL tears and these are among the most frequently performed procedures in our operating rooms. We offer an array of surgical options for treatment, and after examining the patient, discussion with the owner, and review of X-rays (if necessary), we provide our best treatment recommendation for the individual patient. In this condition, also called “dislocating knee cap,” the patella (knee-cap) dislocates or moves out of its normal location. In most early cases of luxating patella, a pet will suddenly yelp and lift its leg off the ground for a short period of time followed by a return to relatively normal limb use as the patella returns to its normal position. These episodes of sudden lameness often increase in frequency over time. The patella may remain dislocated as the condition becomes more advanced. In these instances, the lameness or reluctance to jump may be more persistent, though it may be milder. We strive to tailor our treatment recommendations to the individual patient, rather than seeking a one-size-fits-all approach. Most small- and medium-sized breeds of dogs can be treated using conventional surgical methods. Close scrutiny of the bone structure of larger-size dogs sometimes reveals the need for more complex surgical procedures. 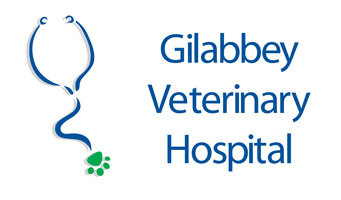 After meeting you and your pet, we will advise you of the treatment options for your pet or the diagnostic steps necessary to make our very best recommendation.